The majestic shorelines of southern Turkey offers so much for the heart to desire – along with its amazing scenery to start. 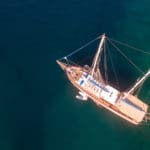 The whole concept of a classic wedding boat charter is unique in Turkey. It is in a country where much of the written romance from history dates back thousands of years. The surroundings are pure and ever so romantic with a new sunrise and sunset each day during your voyage. One can experience a superb wedding on one of the pristine beaches in Turkey’s Mediterranean or add more to the romantic atmosphere with a refined gulet cruise for week on a journey to the Greek Islands such as the very nearby Rhodes. 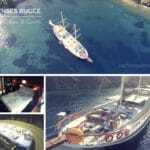 Yacht charter weddings in Turkey are gaining popularity among foreign nationals as it is quite a straight forward process to tie the knot here. As long as you have the right documents prepared, you can further enjoy the actual celebration with your family and friends. 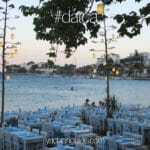 Some of the most popular locations chosen for such a memorable event are in the fantastic harbors of exciting Bodrum, magnificent Marmaris, ancient Fethiye and delightful and quaint little Gocek town. There isn’t much needed to set the scene as the natural beauty that surrounds the region along the southern coast is simply blissful. Decorations are just the symbols to represent this special occasion – whereas the fact that it is a celebration in the Mediterranean is decor enough. Whether you prefer to have it aboard a traditional Turkish wooden gulet or a luxury motor yacht, either vessel will have a captain to marry you. Then after your wedding celebration, you can set sail or cruise off into the magnificent sunset and begin your honeymoon without further a delay. A week long holiday full of romance and romantic places – what more can one ask for? A Mediterranean boat wedding, followed by a tropical honeymoon – all-in-one! The southern coast of Turkey offers 300 days of sunshine. 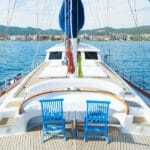 Therefore, a Mediterranean boat hire is pretty much for all seasons. You may with to charter a yacht in Turkey during the Spring when it isn’t so hot, or if you prefer a more summer climate the months of June is quite ideal. But there is no limit to having your wedding boat charter in July or August too. The months of September may still be quite hot as well. On the other hand a wedding in the fall, such as in October can offer you perfect temperatures where you can still enjoy a fantastic time in the sea as well as sun! Usually winter is nowhere near until we reach the middle or end of December – and even then the sun is always shinning. There is no substitute to a perfect wedding. A very special time in your life where everything must be organized and made just right. If you can gather your friends and family for a private wedding boat celebration in Turkey, then you are that much closer to having one of the best times of your life. You might like to have the celebration then go off on your honeymoon, leaving everyone to stay on land while you enjoy an ultimately romantic vacation in breathtaking, Southern Turkey.